Jack Falconer runs the ball for Rockford. Photo by Miles Postema. After a disappointing 1-3 start to the season it seemed as if it just wasn›t in the cards for Rockford to vie for not only OK Red honors but also a chance to extend their playoff streak to an amazing 24 years. But the Rams have rallied for four consecutive wins to push their mark to 5-3 overall and 4-1 in conference play. That leaves them on the precipice of achieving a pair of goals they laid out for themselves when the 2018 season kicked off. 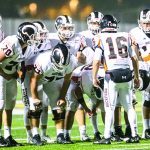 The impressive 42-20 triumph over a solid Grandville squad at Rockford on Friday, October 12th was definitively the high water mark of the season for the Rams thus far. 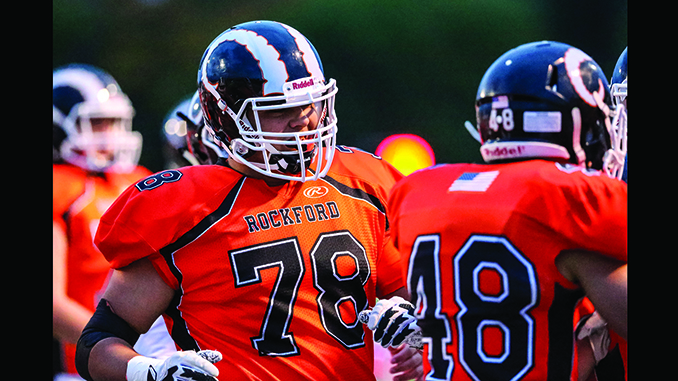 Rockford used solid efforts from all three phases of the game in securing the critical win. The first half was something of a sparring match for both teams with points coming at a premium before a late turnover by Grandville allowed Rockford to take the lead into the locker room. Munger reached deep into the playbook for Rockford to put the first points of the night on the board. Jack Richardson took a hand off and swept to his right while the hard charging Bulldog defense came flying at him from the Grandville 26-yard line. Richardson abruptly pulled up however and fired a pass to a wide open Nate Bareno that he hauled in in stride to make it a 6-0 Rockford lead with 7:12 left in the opening quarter. Teagen Lenderink added the first of his six extra points and it was a 7-0 Ram lead. Grandville wasted no time answering as they broke loose for a 73-yard TD run two plays later to knot things up at 7-7. Until late in the first half it appeared that was how the half may end as both teams failed to threaten end zone in an effort to get back on the board. But a late punt from Richardson was muffed by the Bulldog return man and recovered by Connor White at the Grandville 19 with under three minutes remaining in the first half. 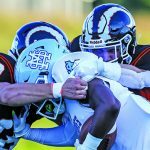 The Rams appeared destined to have to settle for a field goal attempt before a heroic effort gave them a first and goal at the Grandville 4. Sophomore quarterback Chris Corey rolled to his right and fired a low pass that was neatly gathered in by Cade Klimczak just above the turf to keep the drive alive. Two plays later Jaiden Friesen powered the ball in form the one-yard line with 28.2 seconds to play in the half and Rockford took a 14-0 lead into the locker room. But the second half was a much different story as the Rams dominated for the entire 24 minutes. Lenderink got the ball rolling for Rockford in an improbable manner on the second half kickoff to quickly give Rockford a 21-7 lead. In almost every instance of every football team when a team kicks off the kicker hangs back a bit just in case the return man bursts through the initial surge. But Lenderink found himself squarely in the middle of the action as the returner for Grandville fielded the kick inside the five-yard line before sprinting back up the field. He was sandwiched around the 20 by a pair of Rams and the ball squirted directly up the field to a surprised Lenderink at the 29-yard line. Not skipping a beat, the sophomore sprinted around the right side untouched into the end zone and the Rams had a 21-7 lead just 12 seconds into the second half. After forcing a quick three and out defensively Rockford upped the lead again at the 8:04 mark to 28-7. 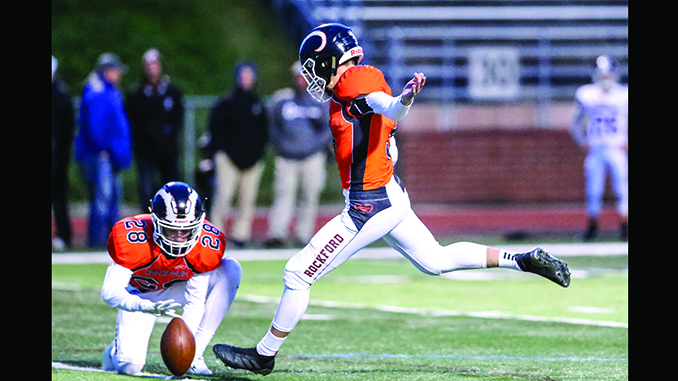 The key play of this 42-yard drive was a great play on both ends of a pass from Drew Bareno to Maverick Pant with Rockford facing a third down and eight from the Bulldog 28. Bareno was facing heavy pressure while rolling to his left and fired a pass upfield off his back foot to the only place Pant had a chance for the reception. Pant dove and hauled the pass in just above ground level before sliding out of bounds at the seven to set up a first down and goal. Richardson ran it in on the next play to make it 28-7. The Bulldogs executed a beautiful fake punt to score a TD to make it 28-14 with 4:59 left in the third quarter and give their fans a glimmer of hope. 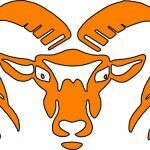 But the Ram offense was just getting into high gear and had a quick retort to push the margin back to three touchdowns. The nine-play 67-yard drive featured a bruising run for 40-yards from Friesen that gave Rockford a first and goal from the Grandville 10. Bareno and Pant hooked up again on the scoring play for a nine-yard touchdown pass to make it 35-14 with 55.9 seconds to play in the third stanza. Rockford’s final score came on a powerful 10-yard run from sophomore fullback Jacob Vega that made it 42-14 with 8:24 left in the contest. Grandville added a meaningless late TD but the point after was blocked by Eli Haddad and the game concluded with a 42-20 Ram win. Richardson led the Ram rushing attack with 15 carries for 104 yards while Friesen added 87 on 11 carries. Rockford was 10 of 13 passing led by Drew Bareno’s 7 for 8 showing for 55 yards and a touchdown. Nate Bareno led the receiving corps with a pair of receptions for 42 yards with Pant contributing 30 on his two catches. Austin Klein led the Ram defenders with 10 tackles while Klimczak and Ian Rodriguez added six apiece. The next game for the Rams features a tall hurdle indeed. Rockford will travel to East Kentwood to take on the 7-1 Falcons on Friday, October 19th. East Kentwood has won seven in a row after a season opening loss. They have won in impressive fashion nearly every week as well while averaging 50 points a game. The Falcons are 5-0 in OK Red play and have clinched at least a share of the league title. But a Rockford win gives them a piece as well. 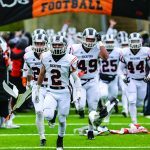 A win also cements Rockford’s 24th consecutive trip to the post season though the Rams still have a chance of advancing with a loss by their aggregate playoff point total in order to fill the 256-team field.